This is a unique flash fiction challenge where Barbara provides a new photo each week, and the first sentence of a story. The challenge is to finish the story using 100-150 words, not including the sentence provided. The challenge runs from Monday to Sunday! “After losing her head, she realised that the rest of her body was falling apart”, Joe would mimic a psychiatrist. I sat by the window. The sun warmed my scalp and shadows danced on my hands. In hiding, I watched police take Joe away last night. He would have calmed down, but only he and I knew that; not our new neighbours. We could have lasted in this abandoned house. If only Joe stayed quiet. My thoughts hurt my head. 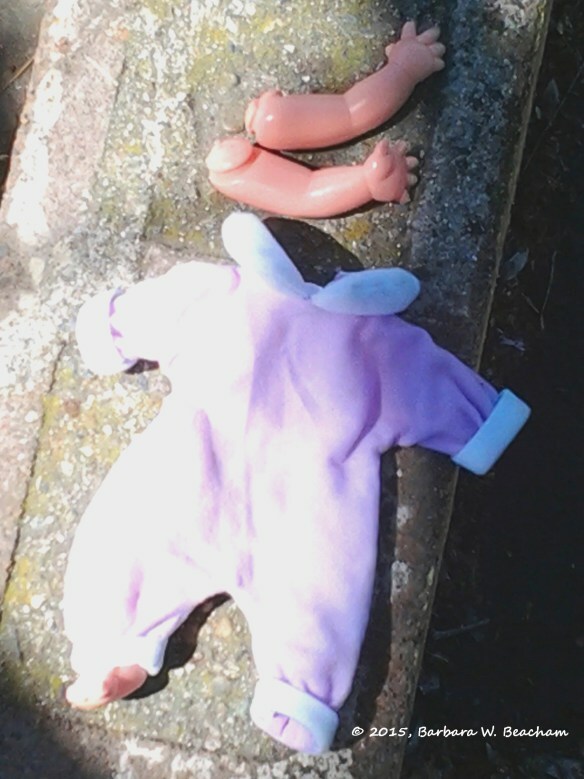 Over the low white fence were a lilac doll pantsuit and two doll hands. I had watched Ava at work yesterday. The toddler first ripped the doll’s head and legs, which she threw towards me. Ava caught me watching her. She laid the doll arms and pantsuit down, and dropping the body, she ran to the house. My eyes salted, thinking how scary I must have looked to her. I must leave before the Johnson Mental Health party arrives. Thank you Suzanne. I appreciate your comment. Yes Jocelyn I see what you mean by a connection. Nicely done by you. Thank you of reading and welcome! Welcome! …and thank you very much. Very interesting story, so much emotion simmering under the surface. Well done. There’s a lot going on below the surface here. Nicely done. I’m glad you enjoyed the reading – yes, it is quite sad. Very good! I enjoyed your story and I really liked the ending. Thank you very much Barbara, that’s what my son called it, “creepy”.